Insert Size: 5" x 7"
Clear Bottom loading styrene acrylic plastic plexi t-frame counter top ad frame print holder sign holder. Bottom loading for fast and easy changes. 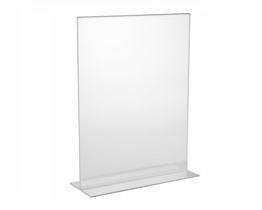 Economical clear plastic sign holder, ad frame or picture frame. Perfect for holding photographs, signs, menus, posting notices and anything else you can imagine. Used by retail stores, event registration tables, restaurants, schools, financial institutions, offices. This is considered a style "C" sign holder which is a bottom-load stand up t-frame designed for counter top or table top use. To keep our costs low, acrylic styrene sign holders are discounted in full case lots. Please contact us for more information.